Experience the first cell-shaded 3D arcade racing game of its kind on the PS2. Create and customize your own over-the-top racing machine to handle the road like a pro. Or choose from over 60 top-of-the-line models. Beat your best time or compete against other driving opponents. Feel the rush of speed as you tear past the spectators, maneuver your way through tight mountain passes and round each corner of the racing track in your ultimate dream car. As you battle your way to the finish line, realize, this is more than just a cartoon! A new 3-D cell-shaded art style called "Artistoon" using Capcom's own proprietary technology gives auto racing an arcade look and feel. Innovative Graphics -- a totally new visual expression that captures the true essence of racing; the sense of speed tearing the air apart and the impact of tires grabbing the pavement are stunningly reproduced. 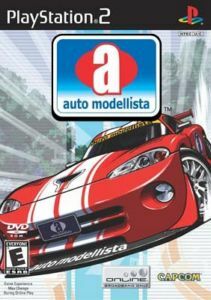 Speed through diverse environments -- auto modellista showcases numerous environments including racing circuits, cityscapes and mountain passes with an entirely new approach. Easily Customizable -- Vivid color schemes and a wide array of options allow players to create incredibly unique car designs. Players can change the car's tires, brakes, suspension, turbine kit, muffler, computer and transmission and more. All tuning parts appear in the game along with their real names. Adding various parts such as mirrors, wheels, decals and more, players can equally modify the appearance of the cars. Sheer intensity -- auto modellista captures the adrenaline packed intensity of racing. This game is simply a must for the insatiable car enthusiast who strives to achieve unadulterated speed and experience mind-blowing graphics.